Mark has over 30 years of experience in the complete process of designing and creating jewelry. He is highly skilled at every step of jewelry design and fabrication. He can take the concept from drawing the sketch, carving the wax model, casting the metal, setting the stones and finally polishing and delivering the finished sparkling piece of exquisite jewelry to your hands. 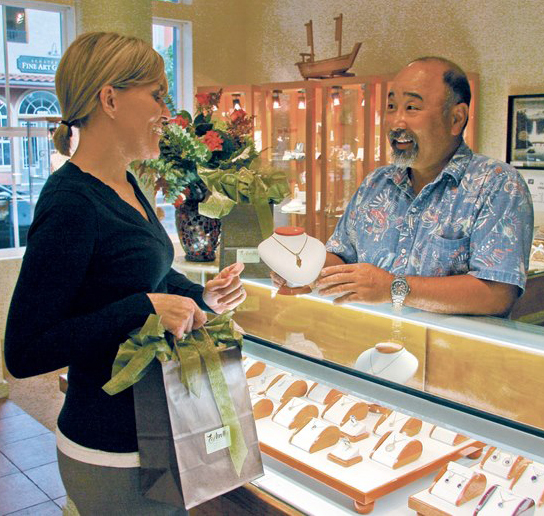 Mario is one of the most beloved jewelers in the area. He brings over 20 years of experience in jewelry fabrication and repair with him. Caring for you and your treasured items is his highest priority. We want to offer you the most complete jewelry experience possible. We have unique, exquisite and hard to find jewelry. If you can't find something that you want, we can design and fabricate it for you. Have a treasure that's been loved so much it's going to pieces? We can revive it giving you more years of wearing enjoyment. We strive to provide the best experience possible for all of our customers. Our goal is to make sure that you are absolutely pleased with your jewelry and our work. Copyright Mark Shimizu Design. All rights reserved.